Icarus Bicycle’s Ian Sutton. Photo via athensfixedgear.gr. My First Bike explores the origins of professional frame builders by going back to the start and looking at the first bike they built. 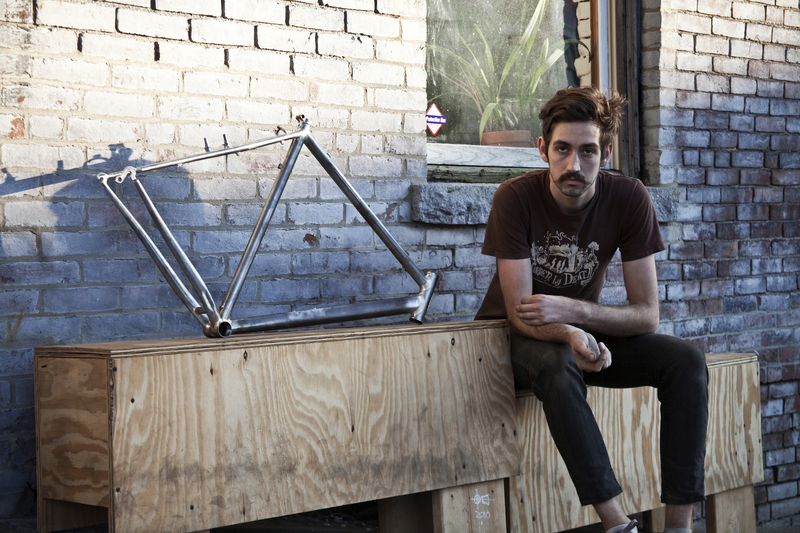 Today’s My First Bike features Ian Sutton of Austin, Texas’ Icarus Bicycles. This is the first frame that I built under the Icarus name. At this point I had studied with Yamaguchi and taken a job at Seven Cycles and was renting some garage shop space with Marty of Geekhouse bikes and Bryan of Royal H Cycles. I built it for a guy named Jody (guy in photo below). He was also working at Seven and had previously been a mountain bike tour guide and bike messenger. For the princely sum of $150 he agreed to be my first guinea pig and allow me to design and build a frame for him. It was made of True Temper VHT tubing with the old curvy seat tube that Yamaguchi developed with them. I brazed on a copper feather that I had carved and beat up to look ragged, I had decided on the Icarus name but hadn’t gotten all the details worked out yet and this frame shows the earliest generation. Jody went on and started to get into alleycats and eventually much more seriously into track racing. He moved to NYC and raced at Kissena in Queens and TTown in Allendale. Since this original frame was built before he had any aspirations for track racing, it was built with a 1″ quill setup and some pretty small diameter tubing. That did not make it ideal for Cat 3 track racing so it eventually became his training bike and around town setup. After mashing on it for the last six years and being ridden into the banking at Kissena, the frame is still in one piece.